Last week I showed you a busy and colorful apartment in NYC. Today I’m showing you a more sedate small home tour. The homeowners of this small cottage painted the walls, ceiling and fireplace surround white to simplify the space. 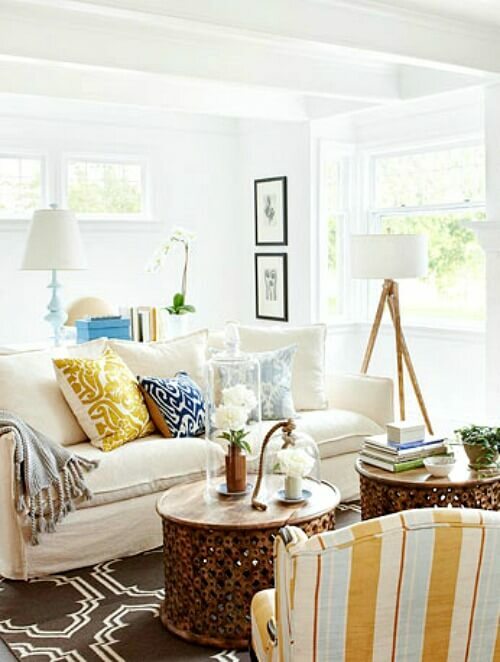 The home features a palette of golden yellow, chocolate brown, and pale blue. 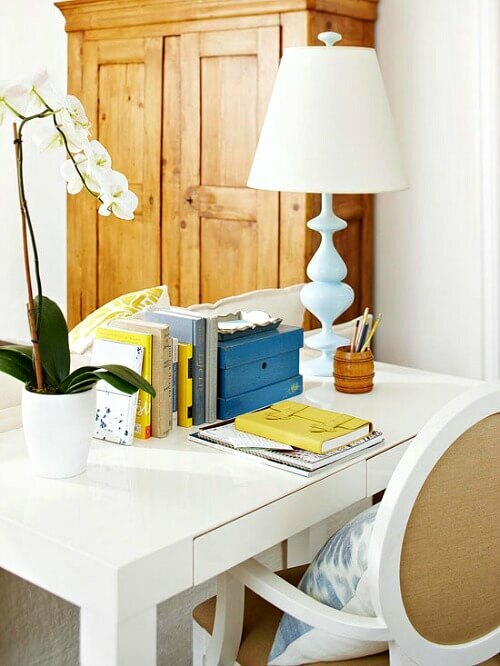 I love this little desk and chair tucked behind the couch, a perfect spot for a desk in a small home. 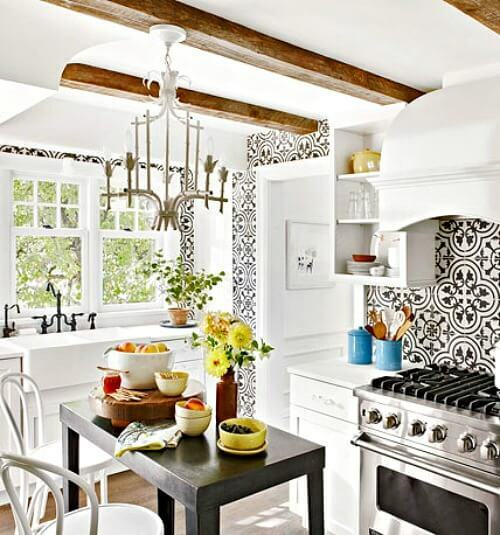 The black and white kitchen is decorated around the striking wall treatment. The small table provides a place for one or two to eat, as well as providing additional prep space. 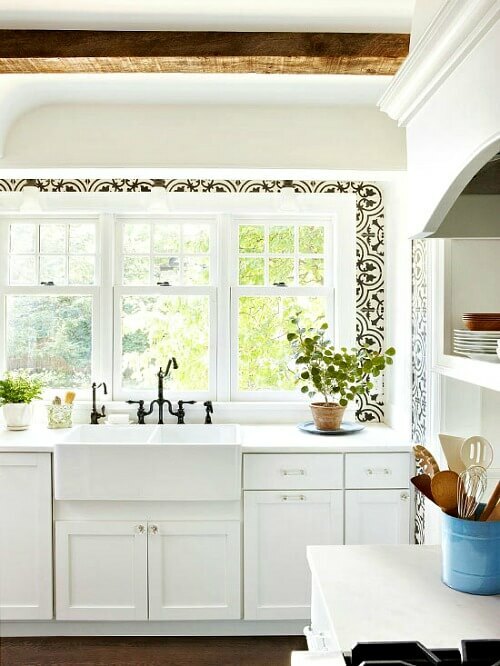 The upper cabinets in the kitchen were removed in order to install these gorgeous windows. Wouldn’t you love all that natural light? I sure would. The homeowner can stand at the sink and gaze out at their vegetable garden. The dedicated dining space has an unfinished dining table with eclectic seating. 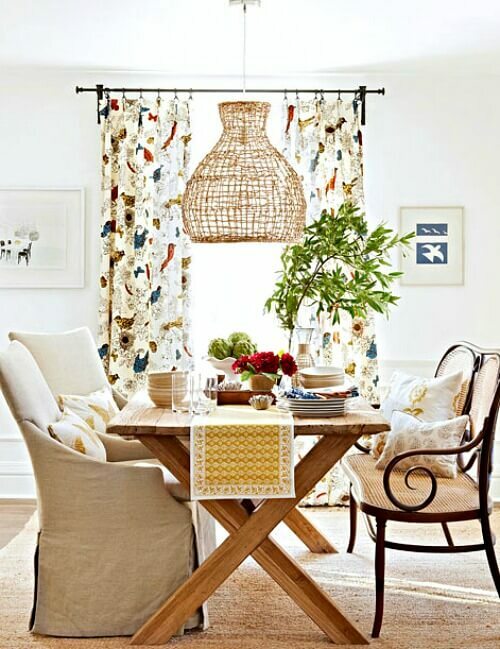 The wicker light overhead lends the room rustic textural appeal. The bedroom is a restful retreat decorated with cottage style linens. 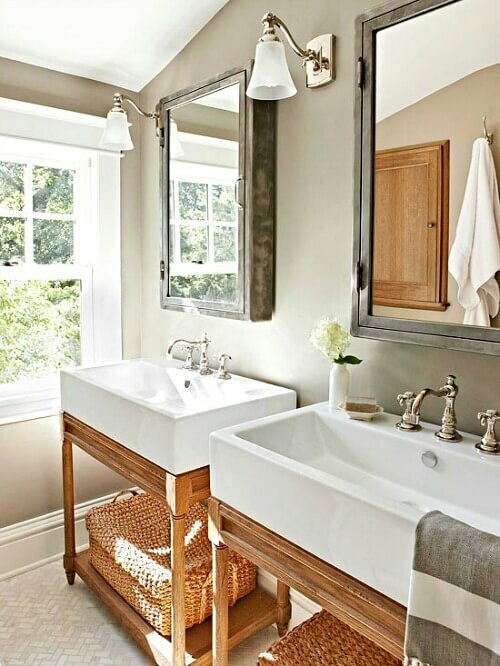 The bathroom has clean modern lines in white and weathered oak and wicker basketry below for storage. This is the renovated basement. It provides a nice hangout for watching TV and entertaining. 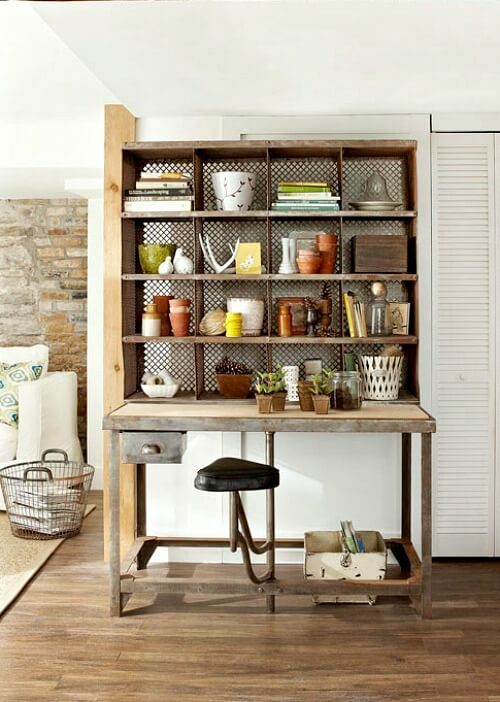 The unique metal and wood book shelves offer a place for display and storage. The attached stool swivels to the side, allowing a spot to take a seat and eat or work. This potting bench with the burlap skirt that conceals pipes is a nice space to work on gardening and potting projects. I hope you enjoyed this small home tour. This is a beautiful space. Even though white can be cold by itself, the colors she has used throughout in decorating really warm it up. Such cute ideas throughout. Love the light fixture in the kitchen and the medicine cabinets in the bathroom. Thanks for sharing this. What a beautiful house. I love the tile in the kitchen! I hope that you and Abbey are well. Absolutely love what they’ve done with their space! Unique touches everywhere! And the color pallette is soothing and yet energizing. I choose natural light where ever I get the option to place it. I love the color scheme on this home, so warm and inviting. Thanks for sharing Brenda. Love the combination of colors and all the unique pieces used throughout the home. The desk behind the sofa is a favorite of mine. 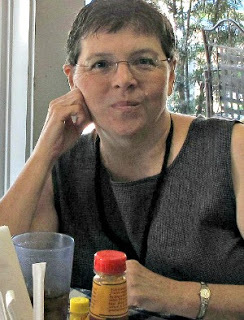 Many years ago, when I lived in an area of old homes in Indianapolis, I would pass this neat house at night and could see her lovely desk behind her sofa. Have loved the idea ever since. Hope Abi will feel much better after today’s visit at the vet. Thanks for sharing this lovely home. What a beautiful home! Love the idea of a little desk behind the couch instead of a sofa table. WOW…. this cottage home is amazing… gorgeous!!!! 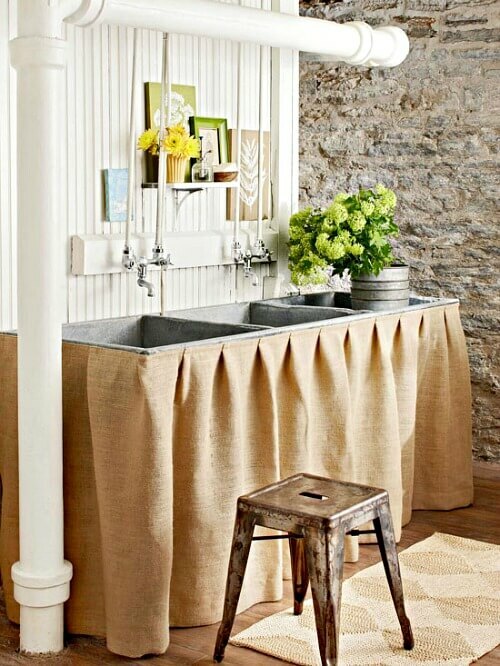 use great use of the space … and ohhh those kitchen windows!! I certainly did enjoy this tour. Love those colors together — looks happy but calming at the same time. There are so many details about this space that I like that it is hard to pick out favorites but I really like that kitchen and I really like that renovated basement space. I’ll bet the exterior of the cottage is just as wonderful. Thank you for this tour. This one is right up my alley. Love it.